Halloween Special Event for kids at Jump and Shout! There's something for every age here! For those of you looking to get your kids into the Halloween spirit, I’ve got a great place for you to check out this season…Jump and Shout Play Center! Located at 1061 N. Dobson Rd., Suite 110 in Mesa between Bass Pro Shop and Cinemark, they will be converting their indoor bounce and play area into a “haunted” play center for us from 3:00pm to 8:00pm on October 30 and 31 (a Friday and Saturday). If you are not familiar with Jump and Shout, then you need to get informed about this great Mesa Riverview secret! 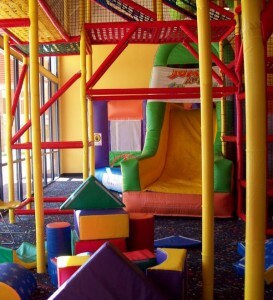 With the Mesa location of Bounce U closing down, Jump and Shout is sure to take over the area business with ease offering not only great bounce equipment for all ages but also climbing areas, large video screens and “bubble time” where huge amounts of bubbles rain down on our little bouncers! The price is only $15.00 per child for over 5 hours of Halloween fun! Don’t miss this great safe, clean and fun Halloween party alternative. It’s great for all ages since they have an area for tots (crawlers to toddlers) as well as larger equipment for older children and even adults! For more information: This facility also offers field trip options for classrooms, party packages, open play and full membership options. You can contact this Jump and Shout location at 480-834-7529 and you can read more about them at their website or through my previous article entitled “Info 101: Indoor Toddler Play Zones” which reviews this facility.